Snacking between meals has something of a bad reputation. But it can be a great way to keep hunger at bay. Many people find healthy snacks to be a big help in keeping hunger at bay. This list of protein packed bites features all my old reliables, many of which are great for snacking on-the-go as they’re portable and can be made ahead of time. Cottage cheese may freak you out at first but give it a go, I promise it’s actually really good. Mix in a little fruit, like some blueberries or strawberries, to sweeten it up and add those all important antioxidants. A mere half cup of cottage cheese packs a seriously impressive protein punch, clocking in at 14 g, and just 116 calories. 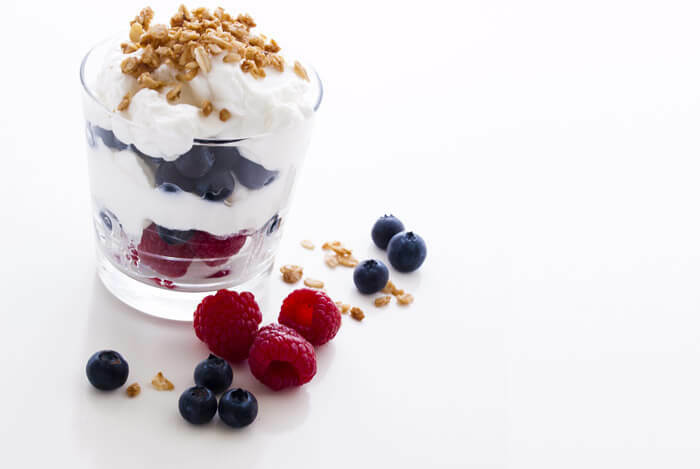 If you’re counting calories, opt for the low fat, 1% milk fat cottage cheese. It only has 81 calories, yet you won’t be compromising on the protein levels at all. On-the-go snacks don’t get much easier than this. You can pick up trail mix in most stores, so there’s really no excuse for unhealthy snacking. But I prefer to mix my own when I can – it means I get to add in what I want and don’t have to worry about any questionable ingredients. 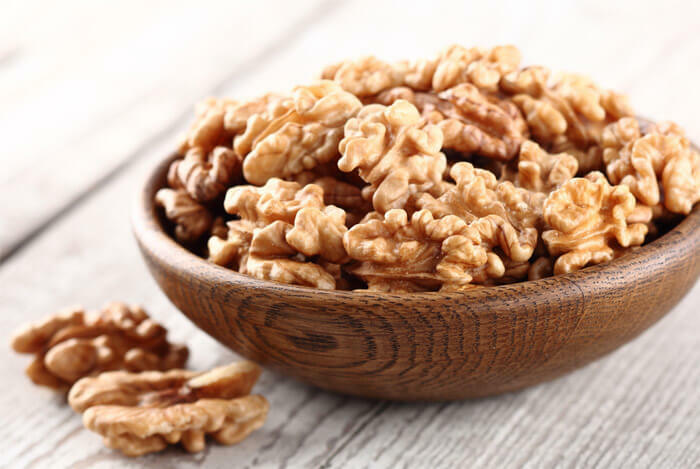 Raw nuts, seeds, shredded coconut, and unsweetened dried berries are all smart choices. My go-to trail mix recipe is a Cranberry-Pumpkin Seed Trail Mix (thanks Martha!). The original recipe says it makes 4 servings of ½ cup each but I find that amount to be a little too high in calories. By dividing it into 6, I get almost 6 g of protein for 163 calories, and then it makes enough to see me through the week. Easy – mix all the ingredients and divide into 6 portions. Quick, simple, and savory, I just love turkey roll-ups. This gluten free bite from Organize Yourself Skinny definitely keeps the hunger pangs at bay. It also contains one of my favorite good fats, avocado. 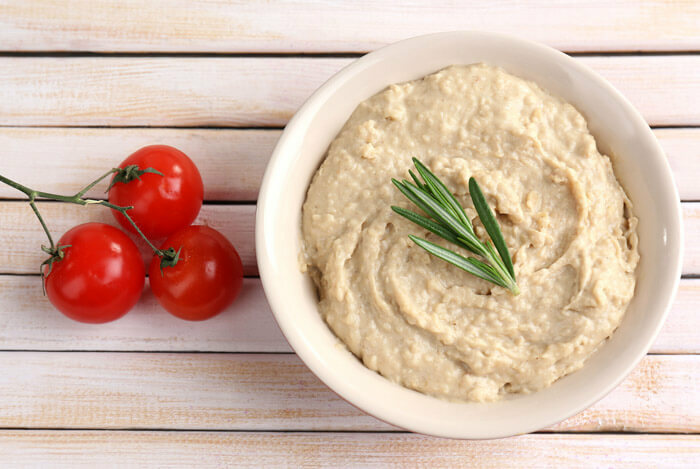 Both the turkey and hummus bring protein to the table meaning this humble 100 calorie snack gives you 8 whole grams of protein. Lay the turkey out flat. If using 2 slices then lay slices onto one another. Spread hummus on top of the turkey. Add the avocado and roll. I’m all about convenience when it comes to healthy eating. That’s why I’m such a fan of this high protein smoothie from Shape.com. 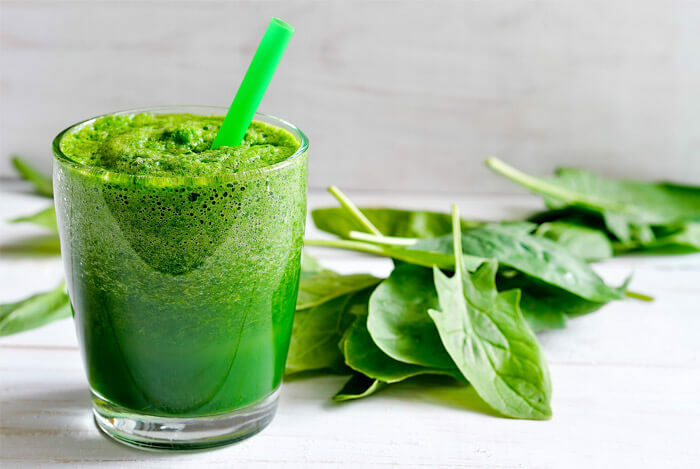 All I have to do is throw a few ingredients into a blender and 30 seconds later I have a filling snack that is an absolute nutritional powerhouse. Feel free to swap the spinach for kale, which I sometimes do. And those who are dairy free can switch up the whey powder for an alternative like pea or hemp protein. 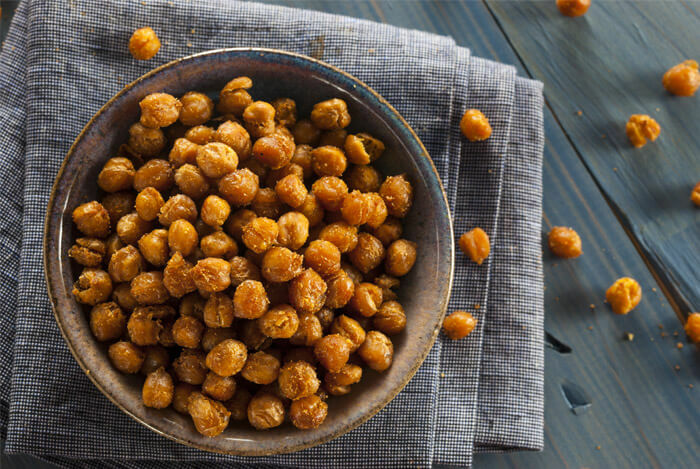 Have you tried roasted chickpeas yet? They’re an awesome snack – crispy and crunchy just like nuts, yet lower in fat. I like mine spicy like in this recipe by Kelly at Eat Yourself Skinny. If spices aren’t for you, herbs, cinnamon, or plain old salt and pepper all work well instead. Chickpeas are also thought to help lower cholesterol in addition to being tasty and filling. Preheat oven to 400F. Stir all the ingredients together in a large bowl, coating the chickpeas thoroughly. Bake, shaking the pans occasionally until the chickpeas are browned and crisp (about 35 to 40 minutes). Serve warm or at room temperature. These homemade energy bites from Angela Liddon over at Oh She Glows are a lot more tasty and don’t have near as much sugar as most store bought brands. They also pack in more protein per calories at 1.4 g of protein per 44 calorie bite. That means I can eat four of these babies for just 176 calories and 5.7 g of protein. They can be stored in the freezer for easy snacking. Oh, and they’re nut free, which is good news for those with allergies. 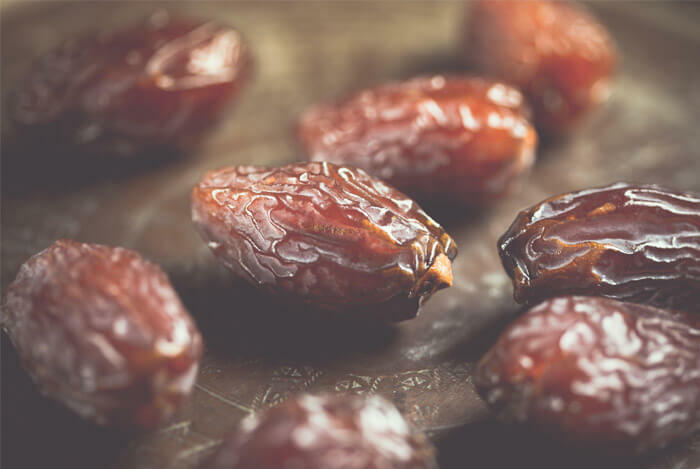 Add dates to a food processor and process until a chunky paste forms. Add in the hemp, chia, sesame, cocoa, vanilla, cinnamon and salt. Process until thoroughly combined. Pulse in the cacao nibs. The dough should be sticky (if not add a tsp or two of water). Shape into small balls and freeze for 20 minutes or so until firm. Store leftovers in the freezer. 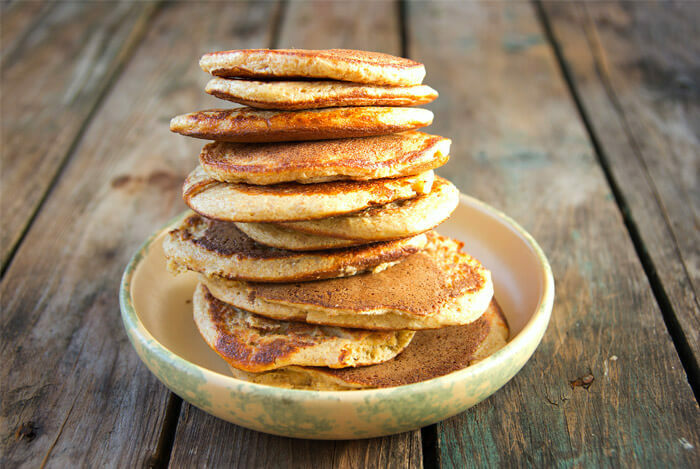 Not just for breakfast, pancakes make an amazing snack – particularly these paleo style ones. If you haven’t tried these already then they might sound a bit weird to you, but I swear you’ll love them. Of course, eggs are one of the best sources of protein you can get, and the banana adds carbs for energy and a little fiber. These pancakes are so easy to make that they barely need a recipe but for those that need step-by-step instructions, this comes courtesy of Hurry the Food Up. Mash up bananas in a large bowl. Whisk eggs and add to banana paste. Fry in a pan with a little heated oil or butter. Another amazing dairy based protein source, Greek yogurt has twice the amount of protein of regular yogurt – giving you serious bang for your buck nutrition wise. This parfait by Iowa Girl Eats is awesome! In addition to calcium rich yogurt, the oats are a good source of fiber and have been shown to help manage blood pressure levels. Throw this together the night before so you can grab it as you head off to work. It also keeps for up to three days in the fridge. In a bowl combine yogurt, oats, chia seeds, and milk. Layer half in a wide-mouth jar or glass. 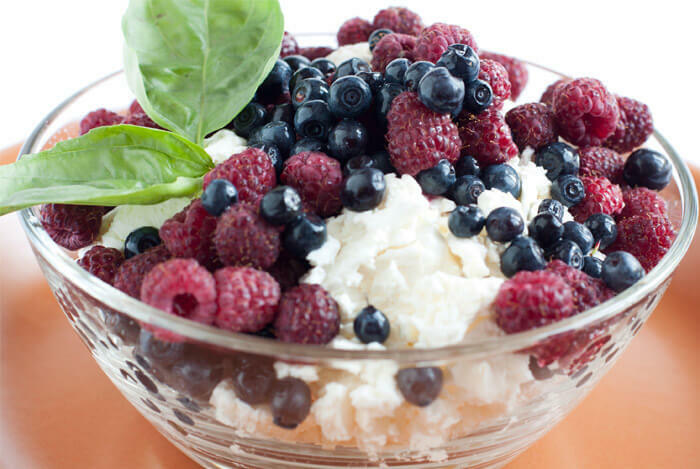 Add half the fruit and berries then layer in remaining yogurt mixture and berries. Refrigerate overnight, or just eat straight away! 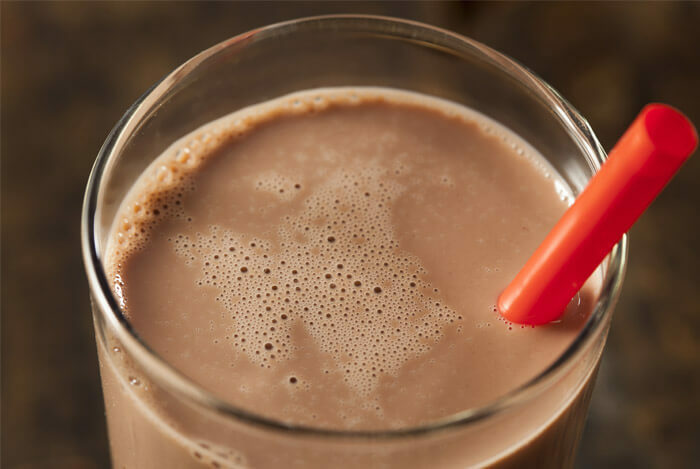 It turns out that low fat chocolate milk provides the optimal mix of carbohydrates and high quality protein for post workout recovery. Well, researchers compared the recovery benefits after exercising of drinking low fat chocolate milk versus water and sports drinks. The athletes who drank the chocolate milk showed improved performance and quicker exercise adaptation. They also gained more muscle and lost more fat. I adapted this recipe from Built Lean ever so slightly by using organic dairy milk instead of almond milk. Combine all ingredients in a small pot on the stove top. Bring mixture to a simmer and stir thoroughly. Remove and enjoy. 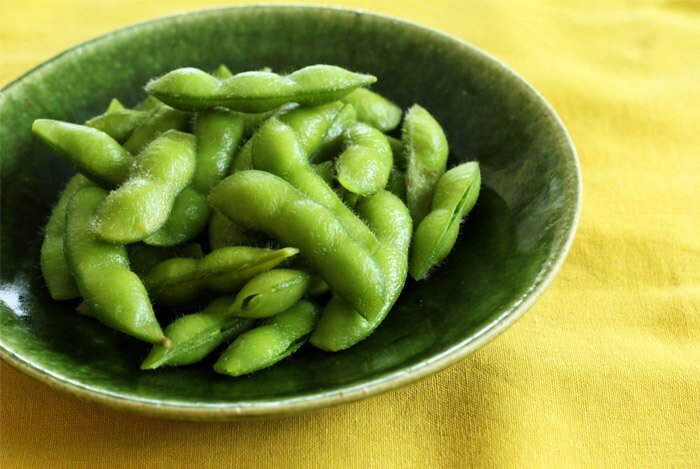 These soybeans are a fresh tasting snack – especially when on the road. Plus, it’s easy to pick up a pack in the store when you’re out and about. You’ll get about 17 g of protein per cup, and just 189 calories. Pretty sweet! If I get the chance, I like to add a little flavor by steaming them for five minutes and drizzling on some extra virgin olive oil. I top it off with a dash of freshly squeezed lemon juice for a tangy twist and immune boosting benefits. 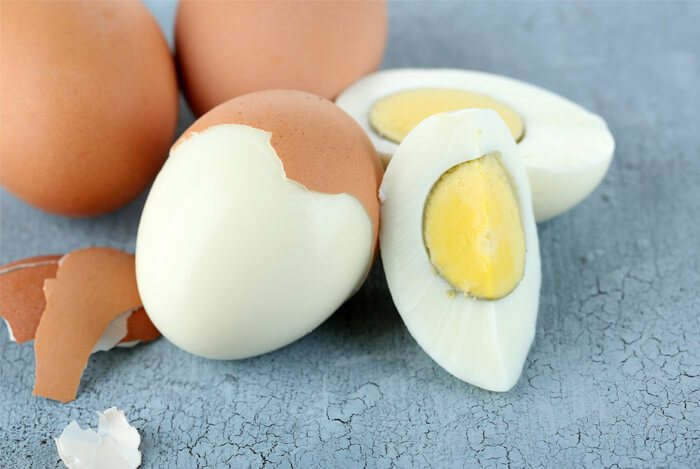 Hard-boiled eggs aren’t the most exciting snack but they are easy to prep ahead, portable, and protein rich. Here’s how I make the perfect hard-boiled egg (hey, it can be tricky – overdone eggs are just plain nasty). Place your eggs in a single layer at the bottom of a saucepan. Cover with cold water. Heat the pot on high and bring the water to a boil. Strain out the water from the pan and run cold water over the eggs to cool them quickly and stop them from cooking further. These will keep in the fridge for five days – perfect to get through the working week. This wrap recipe from Fitness Magazine is a filling snack. It’s really tasty and quick to throw together, and you can leave out the avocado if you want to cut the calories down a little (but you’ll also be missing out on their tasty and healthy fats). 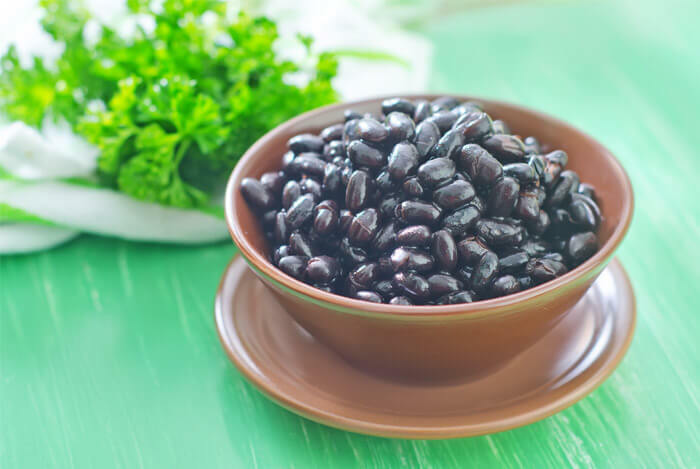 Mix black beans, cumin and salsa. Fill tortillas with bean mixture and chopped avocado. Salmon is one of my favorites. This high protein fish is full of the essential fatty acid omega-3. These impressive little stacks by the Pescetarian and the Pig are simple to throw together and have just four ingredients. Five rounds works out at just 115 calories. 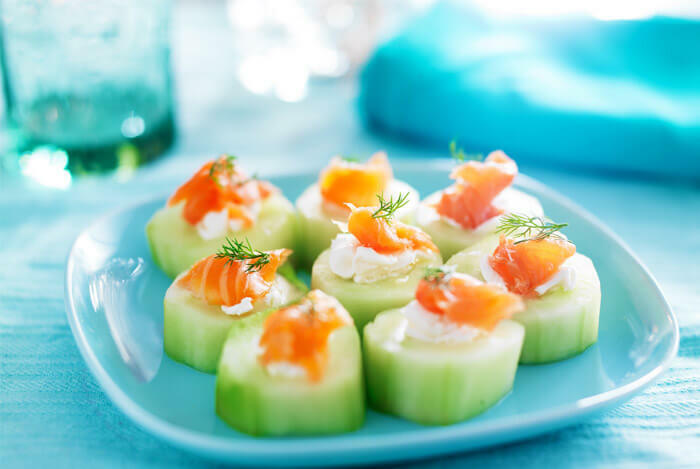 Cut cucumber into 10 rounds and top with a small piece of fresh dill. Then add a little low-fat cream cheese, then a piece of salmon. What’s your take on these high protein snacks? Have anything else you’d like to share? Let me know in the comments below!